"Sir, I am not without the apprehensions of danger that may arise by advising in, or so much as discoursing of, public affairs yet no fear of danger shall hinder me from performing the duty we owe one to another, to counsel those that need our advice, how to make their just defence when they are called in question for their lives especially if they are persons that have, by their general carriage and conversation, appeared to be men of worth, and lovers of their king and country, and of the religion established among us. I will follow the method you use, and answer what you ask in the order I find it in your letters. “I cannot see any disadvantage or hazard, by pleading the general plea of Not Guilty. 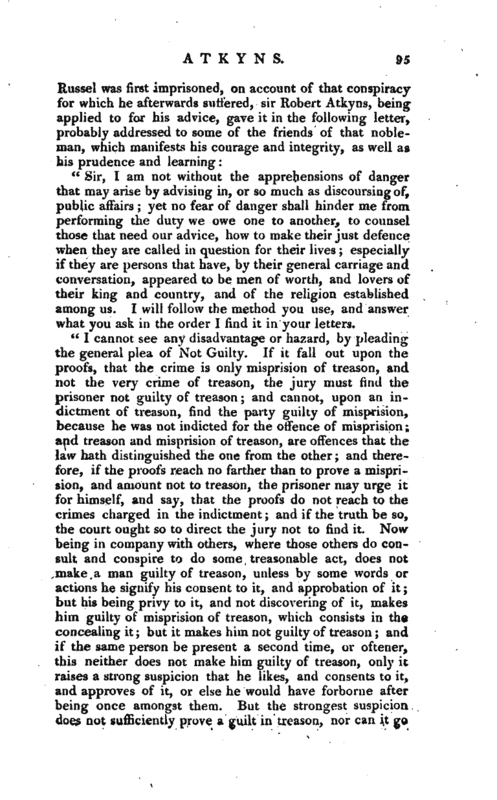 If it fall out upon the proofs, that the crime is only misprision of treason, and not the very crime of treason, the jury must find the prisoner not guilty of treason; and cannot, upon an indictment of treason, find the party guilty of misprision, because he was not indicted for the offence of misprision; and treason and misprision of treason, are offences that the law hath distinguished the one from the other; and therefore, if the proofs reach no farther than to prove a misprision, and amount not to treason, the prisoner may urge it for himself, and say, that the proofs do not reach to the crimes charged in the indictment; and if the truth be so, the court ought so to direct the jury not to find it. Now being in company with others, where those others do consult and conspire to do some treasonable act, does not make a man guilty of treason, unless by some words or actions he signify his consent to it, and approbation of it; but his being privy to it, and not discovering of it, makes him guilty of misprision of treason, which consists in the concealing it; but it makes him not guilty of treason and if the same person be present a second time, or oftener, this neither does not makehim guilty of treason, only it raises a strong suspicion that he likes, and consents to it, and approves of it, or else he would have forborne after being once amongst them. But the strongest suspicion does not sufficiently prove a guilt in treason, nor can it go | for any evidence, and that upon two accounts first, dig proofs in case of treason must be plain, and clear, and positive, and not by inference or argument, or the strongest suspicion imaginable. Thus said sir Edward Coke, in many places in his Third Institutes, in the chapter of High Treason. Secondly, in an indictment of high treason there must not only be a general charge of treason, nor is it enough to set forth of what sort or species the treason is, as killing the king, or levying war against him, or coining money, or the like but there must be also set forth some overt or open act, as the statute of the 25th of Edward IIL calls it, or some instance given by the party or offender, whereby it may appear he did consent to it, and consult it, and approve of it; and if the barely being present should be taken and construed to be a sufficient overt or open act, or instance, then there is no difference between treason and misprision of treason for the being present without consenting makes no more than misprision therefore there must be something more than being barely present, to make a man guilty of treason, especially since the law requires an overt or open act to be proved against the prisoner accused. See sir Edward Coke’s Third Institutes, fol. 12. upon those words of the statute. Per overt fact. And that there ought to be direct and manifest proofs, and not bare suspicions or presumptions, be they never so strong and violent; see the same fol. in the upper part of it, upon the word Proveablement. And the statute of the -5th of Edward VI. cap. 2, requires that there should be two witnesses to prove the crime so that if there be but one witness, let him be never so credible a person, and never so positive, yet if there be no other proof, the party ought to be found not guilty; and those two witnesses must prove the person guilty of the same sort or species of treason. 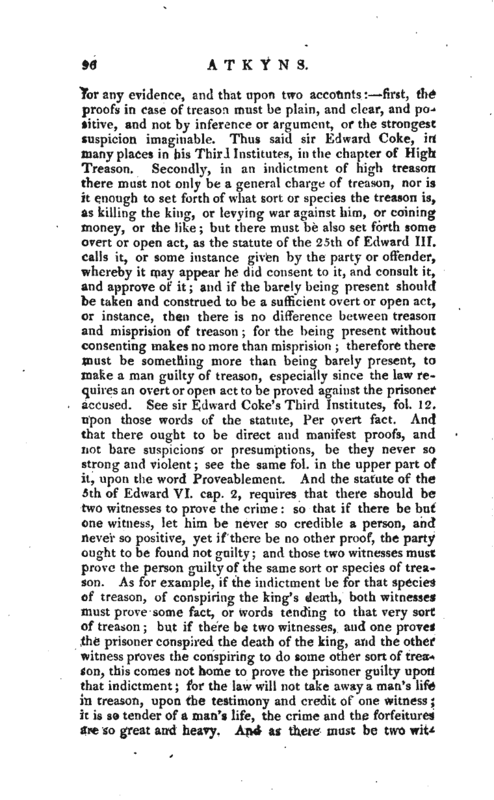 As for example, if the indictment be for that species of treason, of conspiring the, king’s death, both witnesses must prove some fact, or words tending to that very sort of treason but if there be two witnesses, and one proves the prisoner conspired the death of the king, and the other witness proves the conspiring to do some other sort of treason, this comes not home to prove the prisoner guilty upon that indictment for the law will not take away a man’s life in treason, upon the testimony and credit of one witness $t is so tender of a man’s life, the crime and the forfeitures are so great and heavy. And as there must be two | witBesses, so by the statute made in the thirteenth year of his present Majesty, cap. i. (entitled for the safety of his Majesty’s person) those two witnesses must not only be lawful,” but also credible persons. 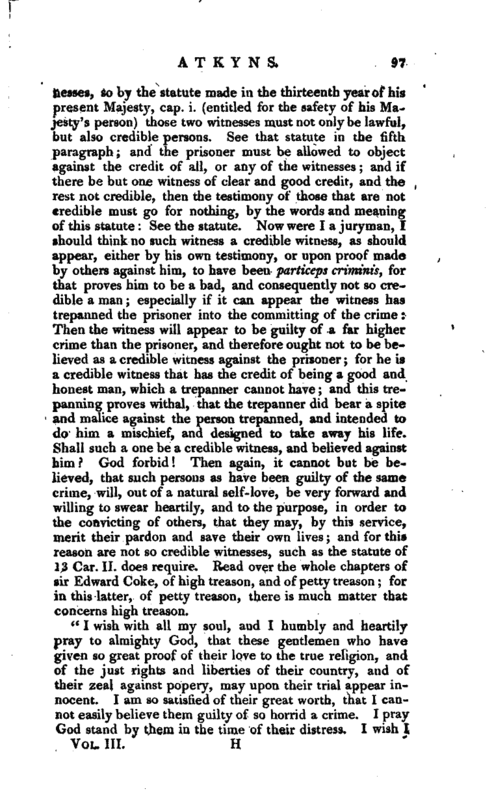 See that statute in the fifth paragraph and the prisoner must be allowed to object against the credit of all, or any of the witnesses and ff there be but one witness of clear and good credit, and the rest not credible, then the testimony of those that are not credible rriust go for nothing, by the words and meaning of this statute See the statute. Now were I a juryman, I should think no such witness a credible witness, as should appear, either by his own testimony, or upon proof made by others against him, to have been particeps criminis, for that proves him to be a bad, and consequently not so credible a man especially if it can appear the witness has trepanned the prisoner into the committing of the crime Then the witness will appear to be guilty of a far higher crime than the prisoner, and therefore ought not to be believed as a credible witness against the prisoner for he is a credible witness that has the credit of being a good and honest man, which a trepanner cannot have and this trepanning proves withal, that the trepanner did bear a spite and malice against the person trepanned, and intended to do him a mischief, and designed to take away his life. Shall such a one be a credible witness, and believed against him God forbid Then again, it cannot but be believed, that such persons as have been guilty of the same crime, will, out of a natural self-love, be very forward and willing to swear heartily, and to the purpose, in order to the convicting of others, that they may, by this service, merit their pardon and save their own lives and for this reason are not so credible witnesses, such as the statute of 13 Car. II. does require. Read over the whole chapters of sir Edward Coke, of high treason, and of petty treason for in this latter, of petty treason, there is much matter that concerns high treason. "I wish with all my soul, and I humbly and heartily pray to almighty God, that these gentlemen who have given so great proof of their love to the true religion, and of the just rights and liberties of their country, and of their zeal against popery, may upon their trial appear innocent. I am so satisfied of their great worth, that I cannot easily believe them guilty of so horrid a crime. I pray God stand by them in the time of their distress. I wish I | might have the liberty fairly to give them what assistance I could in that wherein I might be any way capable of doing it. I beseech almighty God to heal our divisions, and establish us upon the sure foundation of peace and righteousness. I thank you for the favour you have done me by imparting some public affairs, which might perhaps have been unknown to me, or not known till after a long time, for I keep no correspondence. When there is any occasion, pray oblige me by a farther account, especially what concerns these gentlemen and though I have written nothing here but what is innocent and justifiable, yet that J may be the surer against any disadvantage or misconstruction, pray take the pains to transcribe what notes you think fit, out of this large paper, but send me this paper back again, inclosed in another, by the same hand that brings it. In 1684 he appears to have given a fresh proof of his deep learning, in the case between the king and sir William Williams. 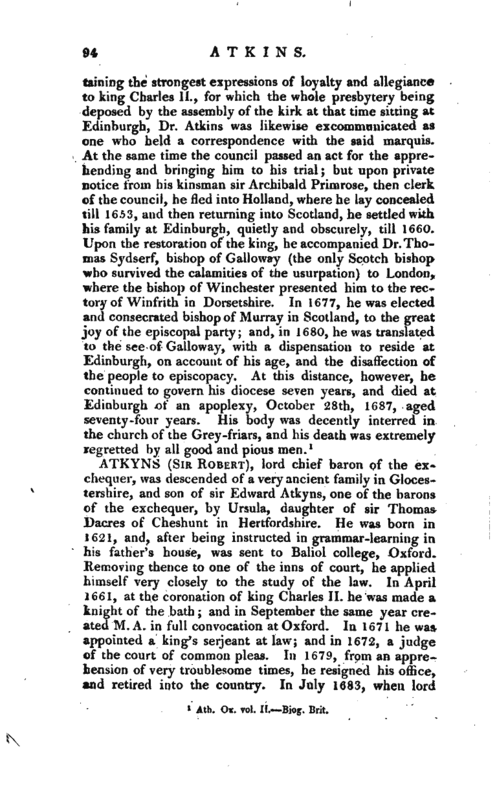 An information was exhibited against William Williams, esq. 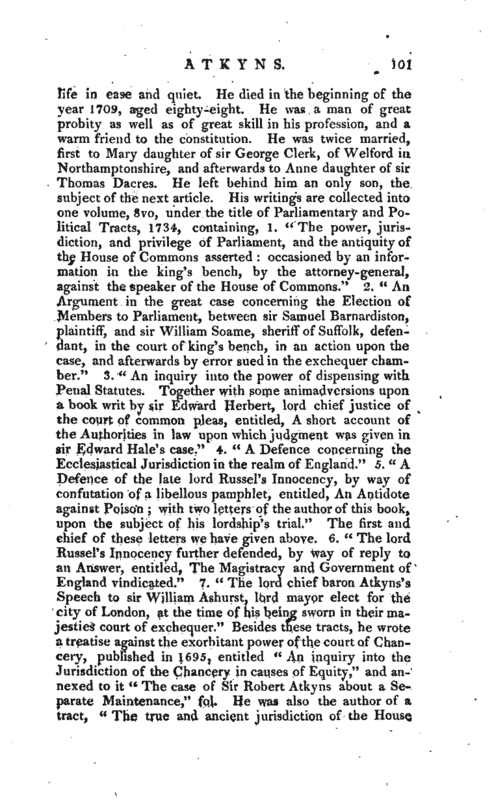 late speaker of the House of Commons, for endeavouring to stir up sedition, and procure ill-will between the king and his subjects, by appointing a certain seditious and infamous libel, entitled “The information of Thomas Dangerfield,” to be printed and published. 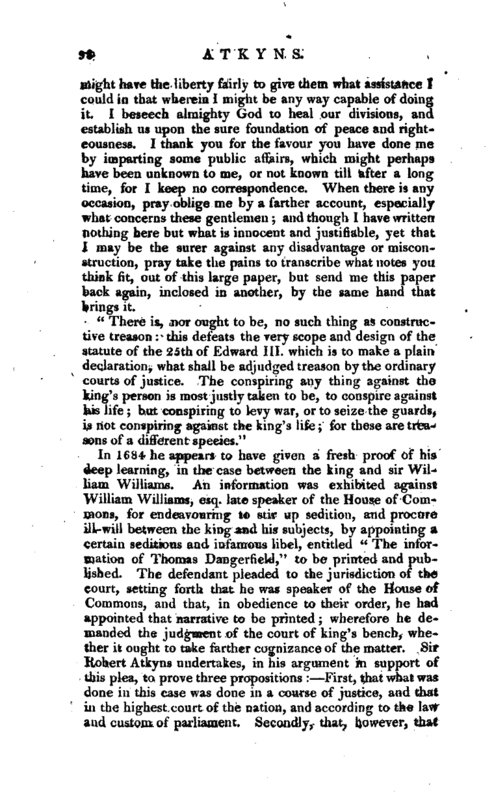 The defendant pleaded to the jurisdiction of the court, setting forth that he was speaker of the House of Commons, and that, in obedience to their order, he had appointed that narrative to be printed; wherefore he demanded the judgment of the court of king’s bench, whether it ought to take farther cognizance of the matter. Sir Robert Atkyns undertakes, in his argument in support of this plea, to prove three propositions First, that what was. done in this case was done in a course of justice, and that in the highest court of the nation, and according to the law and custom of parliament. Secondly^ that., however, that | which was done in this case was not to be imputed to the defendant, who acted in it but as a servant or minister of the parliament, though in a very honourable station. Thirdly, that these, being matters transacted in parliament, and by the parliament, the court of king’s bench ought not to take cognizance of them, nor had any jurisdiction to judge or determine them. An action was brought in Easter-term, in the second year of king James II. against sir Edward Hales, for acting as a colonel of foot without receiving the sacrament, or taking certain oaths appointed by an act of parliament to be taken within a certain time whereupon being legally indicted in the county of Kent, and convicted, the plaintiff became entitled to the forfeiture of five hundred pounds. To this the defendant pleaded, that the king, by his letters patent, had dispensed with his taking the sacrament or the oaths, and therefore demurred generally; the plaintiff joined in demurrer, and judgment was given in the king’s bench for the defendant. 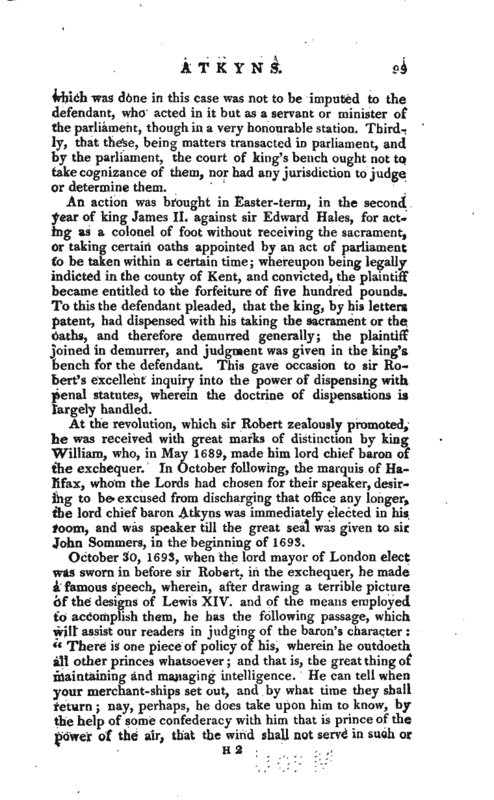 This gave occasion to sir Robert’s excellent inquiry into the power of dispensing with penal statutes, wherein the doctrine of dispensations is largely handled. At the revolution, which sir Robert zealously promoted, he was received with great marks of distinction by king William, who, in May 1689, made him lord chief baron of the exchequer. In October following, the marquis of Halifax, whom the Lords had chosen for their speaker, desiring to be excused from discharging that office any longer, the lord chief baron Atkyns was immediately elected in his room, and was speaker till the great seal was given to sir John Sommers, in the beginning of 1693. October 30, 1693, when the lord mayor of London elect was sworn in before sir Robert, in the exchequer, he made a famous speech, wherein, after drawing a terrible picture of the designs of Lewis XIV. 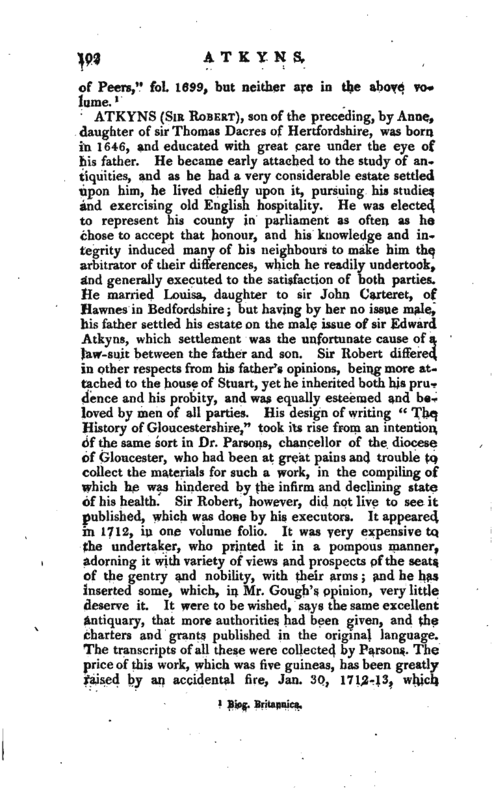 and of the means employed to accomplish them, he has the following passage, which will assist our readers in judging of the baron’s character "There is one piece of policy of his, wherein he outdoeth all other princes whatsoever and that is, the great thing of maintaining and managing intelligence. He can tell when your merchant-ships set out, and by what time they shall return nay, perhaps, he does take upon him to know, by the help of some confederacy with him that is prince of the power of the air, that the wind shall not serve in such or | such a corner till such a time he knoweth when our royal navy is to be divided, and when it is united. "And shall I guess how he comes to have such intelligence That were well worth the hearing. I would but guess at it and I would in my guesses forbear saying any thing that is dishonourable to any among ourselves. We all know the scripture tells us, that the good angels are ministers of God for good to the elect it is the comfort of all good men that they are so. It is said, He will give his angels charge over thee, to preserve thee in thy way and, I hope, we are every one of us in our way. But we have reason to believe that the wicked angels are very instrumental in carrying on such designs, as this great man hath undertaken. "It is a vulgar error that hath obtained among some of us, that these wicked spirits are now confined under chains of darkness in the place of torment. I remember that expression of some of them to our Saviour, Art thou come to torment us before the time It was not then the time of their being tormented it is rather to’be believed that they are wandering about in the air, and there fleeting to and fro, driving on such wicked purposes as this our enemy is engaged in. 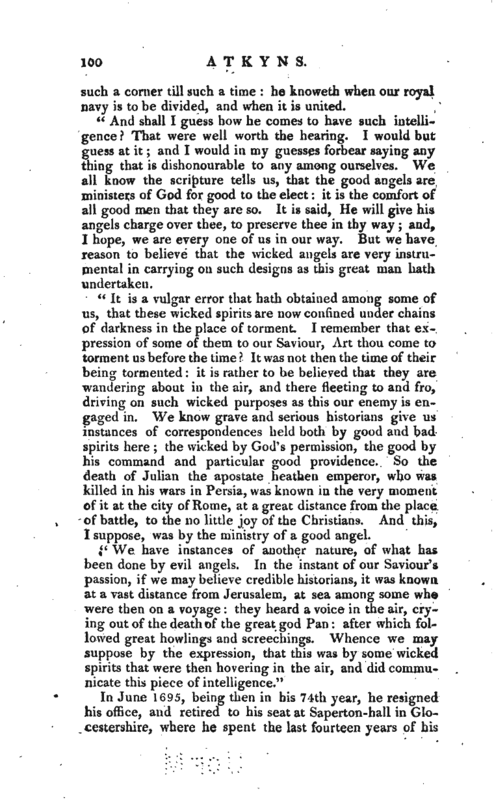 We know grave and serious historians give us instances of correspondences held both by good and bad spirits here the wicked by God’s permission, the good by his command and particular good providence. So the death of Julian the apostate heathen emperor, who was killed in his wars in Persia, was known in the very moment of it at the city of Rome, at a great distance from the place of battle, to the no little joy of the Christians. And this, I suppose, was by the ministry of a good angel.